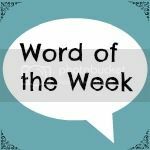 Share the post "Word of the Week 13/2/15"
Hello and welcome to Word of the Week, on Friday the 13th! Thanks to those of you that linked you last week, lovely reading all of your posts. It’s a pleasure to have you all here. This one’s mainly about Boo, as I’ve stood back this week and been amazed by her capacity for learning. This week has seen her move on from learning tricky words to learning spellings each week, this along with her 2 reading books and maths homework, and she is relishing it! She tends to do it all as soon as she’s home with it on a Friday afternoon, and I love seeing her passion for it. I suspect it won’t last forever, so I’m enjoying it while I can! She’s then into her third week of swimming lessons and has earned an award there. I’m pretty sure every child simply gets one after their third lesson to keep them motivated, but she was so excited and is keen to collect her badge and certificate tomorrow. The school offered her a new experience at the start of the week, to learn some Bollywood dancing – she was thrilled and loved that! They’ve also had a book fair on all week after school, so we’ve been in and chosen some new books, for both children, and she was reading those as soon as we got home. I then went into a workshop for a morning, where we got to work with our children and get a feel for the activities they do on a daily basis. This was a great learning experience for me, and it was lovely to see how much my girl is enjoying learning. I learned a little more when I went to parents’ evening last night. It seems that Boo’s a delight and 30 of her would be lovely – I’m not seeing it quite that way! She is a pleasure to have around as she’s kind and friendly to others, well-mannered, listens and does all she’s told, has a good go at everything and is doing well at all’s she trying. She’s likely to exceed most of her learning goals this year. I can’t really ask for more, can I? I am proud. And not to miss out my beautiful boy, I’ve noticed that he’s starting to become more interested in books, literally over this last week. He’s always loved them at bedtime, but unlike his sister, has never been that bothered in the day when there are other toys around to play with. But this week, he’s brought books to me, as well as toys and his beloved paint set. He’s becoming really interested in numbers and shapes, counting and identifying, and I can see a leaning towards non-fiction books, as well as his stories. We’ve also been trying out a few word games, and I’d say his favourites so far are What Can You See? and Name That Tune. I find it easy to get caught up in Boo’s learning, tracking her progress at school and it moves at such a pace there, that I then feel bad for not spotting Little Man’s developments, so I’m making more of an effort to do so, and I hope that eternal mother’s guilt will then subside a little. So I am learning to pay more attention. You must be so proud Jocelyn!! Have a wonderful weekend. Thanks for hosting a beautiful linky… I’m so glad to be back! I love hearing about how your kids are getting on. They really do sound so lovely. Books are just great aren’t they? Once they’re up and reading easily by themselves they seem to inhale them and all their ideas just blossom. Love it. Oh wow! Sounds like an amazing week, you must be so proud of them! I am, it’s been lovely, thanks. Yes, she’s eager for that certificate tomorrow!